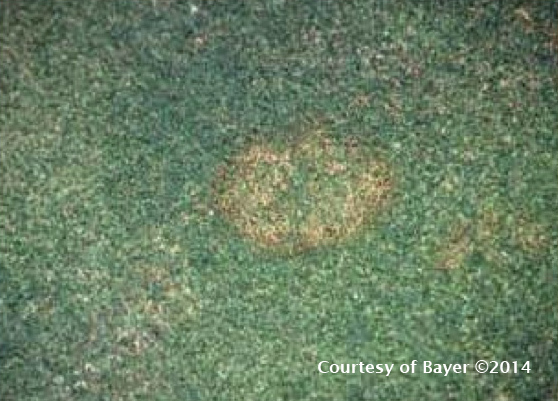 Dollar spot is a fungal disease that impacts upon both the visual appearance and surface quality of turf. It is of particular concern in situations where high surface quality is paramount e.g. creeping bent grass on golf courses. A broad range of turf species are potential hosts for this disease with susceptible species ranging from Bent grass (Agrostis) through to hybrid couches (Cynodon), Kikuyu (Pennisetum) and Zoysia spp. Whilst we note here it is particularly prevalent on intensively managed turf, it is not limited to these situations. Home lawns, parks and other areas of amenity are also sites where this disease can be found. 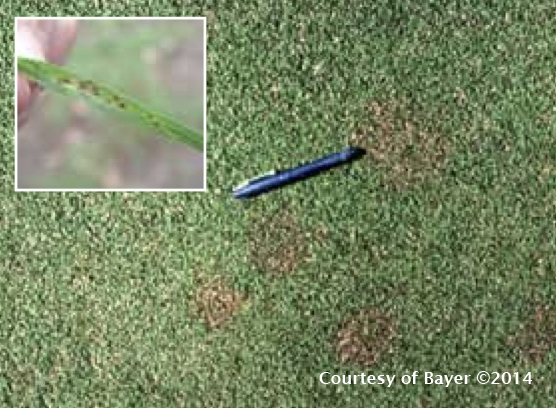 Dollar spot primarily affects leaf tissues but has been shown to have indirect effects on root structure and growth. The disease is found Australia wide. The most conducive conditions for disease occur in spring and late summer / autumn however the problem can be present right throughout summer as well. Day time temperatures between 21 and 28 oc are optimal, with overnight conditions that produce dews enhancing the likelihood of infection. Relative humidity being high (>85%) significantly increases the likelihood of infection. Other factors implicated in disease prevalence are deficiencies of key macro elements nitrogen and potassium, excessive thatch accumulation, dry soils and poor irrigation practices. On finer turf the ‘spots’ appear reasonably well defined in the early stages, 25-60mm in diameter, slightly sunken and tan in colour. Many spots may be found in close proximity to each other. On close inspection the lesions may become paler over time and cover the full width of leaf blades. On coarser grasses with larger leaf widths, the’ spot’ may be quite diffuse and poorly defined with close inspection revealing only part of the leaves being affected. A key feature is a constriction point or girdling (hourglass) often found on affected leaves. Found in all states of Australia, particularly coastal areas. The following conditions heighten the risk of Pythium infection. Brown patch is a fungal disease that becomes active in late spring and summer when high daily temperatures and high relative humidity start to combine. The fine fescues and bent grass species are most susceptible however the warm season grasses may also be attacked. Cool season species tend to be more vulnerable through midsummer while the warm season species suffer more in spring and late summer through to autumn. Interestingly, multiple species of Rhizoctonia tend to complement each other to extend the time of year the pathogen is active and broaden the host range and part of the grass plant that is affected.. As a consequence, there are differences in the effectiveness of chemical control options. Unfortunately, determining which species is causing the problem can be difficult and time consuming. Further complicating matters is the difference in appearance of the disease on closely mown and higher cut turf grasses. The primary causal agent of brown patch is Rhizoctonia solani with R. cerealis, R. zeae and R. oryzae adding to the disease complex. Rhizoctonia is a soil borne fungus, surviving extended periods living saprophytically on dead and decaying organic matter. The pathogen quickly becomes active when warmth, moisture and a susceptible host is available. This fungus has the ability to remain in a state of suspended animation, not growing but not dead, just waiting for conditions to improve. It can remain in this state for years if necessary without losing viability. The most conducive conditions for disease occur when relative humidity is greater than 95%, there is rain or added moisture, warm nights, warm to hot days and soil temperatures have moved above approximately 18°C. 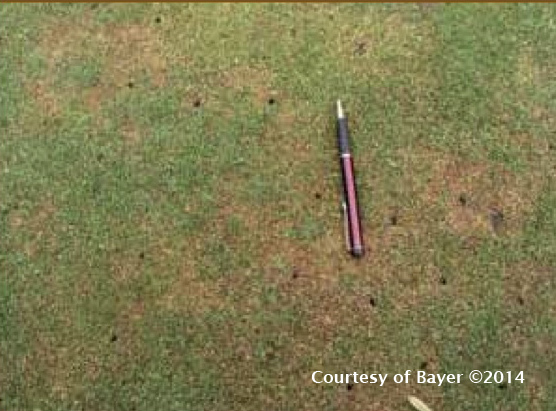 Other factors implicated in disease prevalence are thatch accumulation, excess nitrogen, poor drainage and allowing dew to remain on the leaf for extended periods. On finer turf that is more closely mown, affected areas may appear regular with a noticeable smoke ring around the perimeter. This smoke ring is generally a grey / purple colour and most noticeable in the mornings when dew is present. Upon drying, the area turns a tan / brown colour. This smoke ring is typical of this disease and may help differentiate this from other fungal diseases. It is common for these rings to appear quickly and develop rapidly. Turf that is cut higher, will present with patchy discoloured areas that look less well defined. The turf may appear thinning and in need of water. Sometimes a green centre of seemingly unaffected blades sits within the circular damaged and discoloured areas. In turf that is not high in health to begin with the symptoms may not show an obvious pattern and may look to be generally under-performing lacking resilience to environmental stresses. It is important that such symptoms are not quickly dismissed as an end of season or start of season anomaly. Found in all states of Australia. ‘Colletotrichum graminicola’ is the most common pathogen responsible for causing anthracnose diseases in turf. Often anthracnose is observed as a foliar blight, when turf grass leaves are noticeably infected appearing either yellow with possible red lesions. This disease also has the ability to significantly affect the turf plants crown and roots. Anthracnose affects certain warm and cool season turf species including but not limited to Poa, Festuca, Lolium and cynodon sp. The causal fungus, survives the winter as dormant resting structures in infected plant debris. During early spring outbreaks of anthracnose basal rot is common as the fungus, which may have overwintered in the plant, initiates infection at the crown. 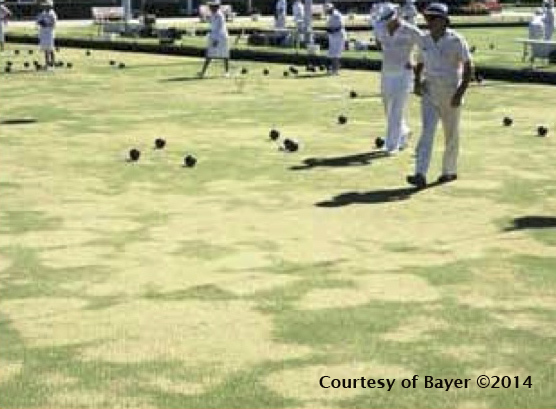 Outbreaks of anthracnose foliar blight and/or basal rot can occur when spores produce acervuli which are dispersed by splashing water or tracked by mowing equipment from one area to another. These spores then germinate and cause new infections on other plants. Anthracnose is likely to occur when plants are growing slowly (during periods of overly hot or cold temperatures), during overcast periods, and in high humidity. Climatic conditions that favour the development of anthracnose are average daily temperatures over 25°C, making it a significant problem during spring through to autumn. The disease favours high humidity and hot summers in subtropical to temperate climatic zones and thrives with long hours of leaf and canopy wetness. Primarily the visual symptoms consist of irregularly shaped patches of yellow / bronzing turf, ranging from 20mm to 0.5m with reddish to brown spots appearing on the leaves. Numerous black fruiting bodies can also be seen using a hand lens or microscope on the leaves. Anthracnose is broadly distributed from sub-tropical to sub temperate climates. Winter Fusarium is caused by the fungus ‘Microdochium nivale’. 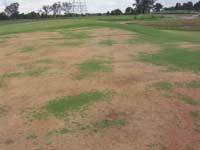 It is primarily a winter disease of cool season turf, however it has been observed to also infect warm season turf species. It is often characterised by an orange / brown colour in the patch and patch borders of affected turf grass. ‘Fusarium Patch’ and ‘Pink Snow Mould’ are caused by the same fungus, however they can be considered two different diseases because of their environmental conditions needed (i.e. 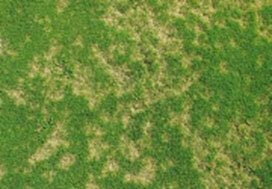 Fusarium Patch is the common name used when it the disease occurs in the absence of snow cover). Temperature conditions that heighten the risk of Fusarium infection range from near freezing to around 16°C. Because Fusarium favours cooler conditions and is normally associated with low humidity, however infection risk increases with long periods of leaf and shoot wetness. Symptoms develop slowly and can take several weeks from the time of infection to be clearly visibility. Circular patches first appear as water-soaked spots at less than 5cm in diameter, then rapidly change colour to tan, brown, dark brown and finally light grey. Patches can enlarge u to 20cm in diameter overtime. Fungal mycelium may be seen within the shoot system of affected area. The mycelium is white in colour, but in direct sunlight induces spore production, which is a pink colour. The dominant cause of the turf disease known as ‘Spring Dead Spot’ or ‘Necrotic ring spot’ is Ophiosphaerella korrae (formerly Leptosphaeria). This fungus is a member of the ectotrophic root-infecting (ERI) fungi, a complex of soil borne pathogens. Spring dead spot appears as circular patches of “bleached”, straw-coloured dead grass, a few cm to 1m in diameter (commonly less than 50cm) when turf resumes growth in spring. The patches may combine to form large areas. On affected plants dark elliptical sclerotia (a compact mass of hardened fungal mycelium) are often visible on stolons. Dark sunken lesions can be seen on affected crown buds, roots and stolons; these areas may become black, necrotic, and brittle in advanced stages of infection. Sometimes, the symptoms are not evident until 2-3 or more years after the establishment of the disease at which time the centres may remain alive and take on a “ring-like” appearance. Spring Dead Spot is thought to survive unfavourable environments as mycelial plaques in plant debris. The fungus is thought to move from plant to plant by growing ectotrophically along the surface of roots and rhizomes, and infecting cells in the root cortex Patches are commonly seen in Spring, hence the name spring dead spot. However, symptoms can also be seen in autumn and winter after cool climatic conditions and /or wet weather. The disease can be transferred by vegetative turf material (i.e. rhizomes and stolons or solid turf). Spring Dead Spot infection occurs when average daily soil temperatures drop to between 12°C and 14°C and is therefore exacerbated by wet weather and moist soil conditions in Autumn. The disease disrupts the aesthetics, uniformity, and functionality of lawns, golf courses, and sports fields. Large patches up to 1 metre can be observed and if the root disease is prolific it can be unsightly and difficult to recover the turf to its former health. Patches kill the turf foliage and the rhizomes become discoloured, rotten and sunken. Scars can remain for several years following damage. Patches may appear in the same spot for multiple years. Weeds are often found within the centre of the patches where competition is less severe to non-existent. 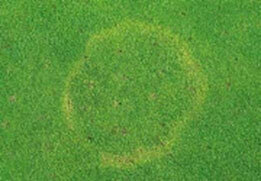 Spring Dead Spot occurs in a wide range of climates, from tropical to sub temperate.